Canadian Opera Company. Eugene Onegin. Music by Pyotr Ilyich Tchaikovsky. Robert Carsen, stage director. Four Seasons Centre for the Performing Arts, 145 Queen St. W. 416-363-8231. $35-$225. Opened Sep 30. Runs to Nov 3. Days and times vary, visit coc.ca for details. Canadian Opera Company. Vocal Series: Glancing Back, Looking Ahead. U of T Opera. Richard Bradshaw Amphitheatre, Four Seasons Centre for the Performing Arts, 145 Queen St. W. 416-363-8231. Free. First come, first served. No late seating. Oct 4, 12pm. Canadian Opera Company. Hadrian. Music by Rufus Wainwright, libretto by Daniel MacIvor. Four Seasons Centre for the Performing Arts, 145 Queen St. W. 416-363-8231. $35-$225. Opens Oct 13, 7:30pm. Runs to Oct 27. Days and times vary, visit coc.ca for details. Castle Music Productions. inCanto: A Journey of Italian Music Through Time. Music from Puccini, Il Volo, Pavarotti, Sinatra, Modugno and Mina. Roselawn Centre, 296 Fielden Ave., Port Colborne. 905-834-7572. $40. Oct 13, 8pm. Curtain Call Players. The Wedding Singer. Music by Matthew Sklar, lyrics by Chad Beguelin, book by Tim Herlihy and Chad Beguelin, based on the film. Fairview Library Theatre, 35 Fairview Mall Dr. 416-703-6181. $30. Opens Nov 2, 8pm. Runs to Nov 10(mat). Thurs-Sat(8pm). Sat/Sun(2pm). Dancyn Productions. Billy Bishop Goes to War. Written and composed by John MacLaughlan Gray and Eric Peterson. Ontario Regiment RCAC Museum, 1000 Stevenson Rd. N., Oshawa. 905-233-8420. $35. Opens Oct 24, 8pm. Runs to Oct 28. Wed-Sat(8pm), Sat/Sun(2pm). Drayton Entertainment. Kings and Queens of Country. Drayton Festival Theatre, 33 Wellington St. S., Drayton. 1-855-372-9866. $27-$46. Opens Oct 3, 2pm. Runs to Oct 14. Days and times vary. Visit draytonentertainment.com for details. Drayton Entertainment. Ghost, the Musical. Music, lyrics and book by Bruce Joel Rubin, Dave Stewart and Glen Ballard, based on the film by Bruce Joel Rubin. St. Jacobs Country Playhouse, 40 Benjamin Rd. E., Waterloo. 1-855-372-9866. $27-$46. Opens Oct 3, 2pm. Runs to Oct 21. Wed/Thurs/Sat/Sun(2pm), Wed-Sat(7:30pm). Drayton Entertainment. Man of La Mancha. Music by Mitch Leigh, lyrics by Joe Darion, book by Dale Wasserman. Hamilton Family Theatre Cambridge. 46 Grand Ave. S., Cambridge. 1-855-372-9866. $27-$46. Opens Oct 10, 2pm. Runs to Nov 4. Tues-Thurs/Sat/Sun(2pm), Thurs-Sat(7:30pm). Etobicoke Musical Productions. A Funny Thing Happened on the Way to the Forum. Music and lyrics by Stephen Sondheim, book by Burt Shevelove and Larry Gelbart. Meadowvale Theatre, 6315 Montevideo Rd., Mississauga. 416-248-0410. $30; $28(sr/st). Opens Oct 19, 8pm. Runs to Oct 28. Thurs-Sat(8pm), Sun(2pm). Note: also Oct 27(2pm). Georgetown Bach Chorale. Opera Gala. Arias, duets and choruses from popular operas. St. John’s United Church, 11 Guelph St., Georgetown. 905-873-9909. $30; $10(st/child). Oct 20, 8pm. Hart House Theatre. Heathers: The Musical. Music, lyrics and book by Kevin Murphy and Laurence O’Keefe, based on the film by Daniel Waters. Hart House Theatre, 7 Hart House Circle. 416-978-8849. $28; $17(sr); $15(st). Opened Sep 21. Runs to Oct 6. Wed-Sat(8pm), Oct 6(2pm/8pm). International Resource Centre for Performing Artists. Singing Stars: The Next Generation. A program of opera and oratorio arias. Rachel Andrist, piano. Zoomer Hall, 70 Jefferson Ave. 416-362-1422. $30(door); $25(adv); $20(sr/arts workers adv). Nov 5, 7:30pm. Lower Ossington Theatre. The Producers. Music and lyrics by Mel Brooks, adapted by Mel Brooks and Thomas Meehan from the film. Lower Ossington Theatre, 100A Ossington Ave. 416-907-0468. $54.99-$64.99. Opened Sep 8. Runs to Nov 11. Thurs-Sat(7:30pm), Sat(3:30pm), Sun(4pm). Lower Ossington Theatre. Rocky Horror Show. Music, lyrics and book by Richard O’Brien. Lower Ossington Theatre, 100A Ossington Ave. 416-907-0468. $54.99-$64.99. Opened Sep 21. Runs to Oct 27. Fri/Sat(8pm/11pm). Lower Ossington Theatre. Newsies. Music by Alan Menken, lyrics by Jack Feldman, book by Harvey Fierstein. Randolph Theatre, 736 Bathurst St. 1-888-324-6282. $54.99-$69.99. Opens Nov 2, 7:30pm. Runs to Nov 25. Fri/Sat(7:30pm), Sat(3:30pm), Sun(12pm,4pm). Mirvish. Ain’t Too Proud. Featuring the music of The Temptations. Princess of Wales Theatre, 300 King St. W. 416-872-1212. $59 and up. Opens Oct 11, 8pm. Runs to Nov 17. Tues-Sat(8pm), Wed(1:30pm), Sat/Sun(2pm). Mirvish. Bat Out of Hell: The Musical. Music, lyrics and book by Jim Steinman. Ed Mirvish Theatre, 244 Victoria St. 416-872-1212. $29 and up. Opens Oct 16, 8pm. Runs to Nov 4. Tues-Sat(8pm), Wed(1:30pm), Sat/Sun(2pm). Mirvish. Come From Away. Music, lyrics and book by Irene Sankoff and David Hein. Royal Alexandra Theatre, 260 King St. W. 416-872-1212. $69 and up. Ongoing. Tues-Sat(8pm), Wed(1:30pm), Sat/Sun(2pm). Mirvish. Forever Tango. Ed Mirvish Theatre, 244 Victoria St. 416-872-1212. $25 and up. Opens Nov 6, 8pm. Runs to Nov 11. Tues-Sat(8pm), Wed(1:30pm), Sat/Sun(2pm). Mirvish. Friends! The Musical Parody. CAA Theatre, 651 Yonge St. 416-872-1212. $64-$99. Opens Nov 1, 8pm. Runs to Nov 25. Tues-Sat(8pm), Sat/Sun(2pm), Wed(1:30pm). Music on Main. In Concert. Works by Verdi, Rossini, Wagner, Mozart, Vaughan Williams and others. Trinity United Church, 461 Park Ave., Newmarket. 905-895-4851. $20; $10(st). Oct 13, 7:30pm. Musical Stage Company. Dr Silver: A Celebration of Life. Music, lyrics and book by Anika Johnson & Britta Johnson. Heliconian Hall, 35 Hazelton Ave. 416-927-7880. $50-$65; $29(st). Opened Sep 13. Runs to Oct 7. Days and times vary. Visit drsilverto.ca for details. National Ballet of Canada. Fall for Dance North Festival: Paz de la Jolla. Music by Bohuslav Martinů. Justin Peck, choreographer. Sony Centre for the Performing Arts, 1 Front St. E. 1-855-872-7669. $15. Opens Oct 2, 7:30pm. Runs to Oct 6. Tues-Fri(7:30pm), Sat(2pm). Opera Atelier. Charpentier: Actéon / Rameau: Pygmalion. Elgin Theatre, 189 Yonge St. 1-855-622-2787. $46 and up. Opens Oct 25, 7:30pm. Runs to Nov 3. Days and times vary. Visit operaatelier.com for details. Opera by Request. Mozart’s Die Zauberflöte (The Magic Flute). Music by W. A. Mozart, libretto by Emanuel Schikaneder. In concert with piano accompaniment. College St. United Church, 452 College St. 416-455-2365. $20. Opens Nov 2, 7:30pm. Also Nov 3. Opera York. La Bohème. Music by Giacomo Puccini, libretto by Luigi Illica and Giuseppe Giacosa. Richmond Hill Centre for the Performing Arts, 10268 Yonge St., Richmond Hill. 905-787-8811. $40-$50. Also Nov 4(mat). Opens Nov 2, 7:30pm. Also Nov 4(2pm). Royal Conservatory. Koerner Hall 10th Anniversary Gala: Kathleen Battle. Opera arias and Broadway selections. 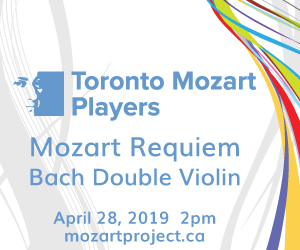 Koerner Hall, Telus Centre, 273 Bloor St. W. 416-408-0208. $100-250. Oct 2, 8pm. Scarborough Music Theatre. Oklahoma! Music by Richard Rodgers, lyrics and book by Oscar Hammerstein II. Scarborough Village Community Centre, 3600 Kingston Rd. 416-267-9292. $30; $27(sr/st). Opens Nov 1, 8pm. Runs to Nov 17(mat). Thurs-Sat(8pm), Sun(2pm). Shaw Festival. Grand Hotel. Music and lyrics by Robert Wright and George Forrest, additional music and lyrics by Maury Yeston, book by Luther Davis. Festival Theatre, 10 Queen’s Parade, Niagara-on-the-lake. 1-800-511-7429. $30 and up. Previews from May 3. Runs to Oct 14. Days and times vary. Visit shawfest.com for details. Soulpepper/Obsidian Theatre Company. Oraltorio: A Theatrical Mixtape. Created and performed by Motion and DJ L’Oqenz. Young Centre for the Performing Arts, 50 Tank House Lane. 416-866-8666. $35. Opens Oct 2, 8pm. Runs to Oct 20. Days and times vary. Visit soulpepper.ca for details. Stratford Festival. The Rocky Horror Show. Music, lyrics and book by Richard O’Brien. Donna Feore, director and choreographer. Avon Theatre, 99 Downie St, Stratford. 1-800-567-1600. $25 and up. Previews from Apr 27. Runs to Oct 31. Days and times vary. Visit stratfordfestival.ca for details. Toronto Musical Concerts. Merrily We Roll Along. Music and lyrics by Stephen Sondheim, book by George Furth. Al Green Theatre, 750 Spadina Ave. 647-298-9338. $25; $20(sr/st). Opens Oct 17, 7:30pm. Also Oct 18. Toronto Operetta Theatre. Elizabeth and Friends: A Night Among the Stars. Music from Gilbert & Sullivan to Broadway. Elizabeth DeGrazia, soprano; Gabrielle Prata, mezzo; Keith Klassen, tenor; Robert Longo, baritone. Arts and Letters Club, 14 Elm St. 416-922-2912. $45. Oct 11, 8pm. Toronto Operetta Theatre. Out of Character. Music from Latin America. St. Lawrence Centre for the Arts, 27 Front St. E. 416-922-2912. $29-$49. Nov 3, 4pm. Unsung Heroes Productions. The Jewish Mega Musical Revue. Vaughan City Playhouse, 1000 New Westminster Dr, Thornhill. unsungheroesproductions.com. $40. Opens Oct 20, 7pm. Also Oct 21(1pm, 7pm). VOICEBOX: Opera in Concert. Comedy Unbound! A tribute to Stuart Hamilton. St. Lawrence Centre for the Arts, 27 Front St. E. 416-366-7723. $20; $38; $50. Oct 21, 2:30pm. Young People’s Theatre. Mary Poppins. Music and lyrics by Richard M. Sherman and Robert B. Sherman, with George Stiles and Anthony Drewe, book by Julian Fellowes. Young People’s Theatre, 165 Front St. E. 416-862-2222. $10-$65. Opens Nov 5, 10:15am. Runs to Jan 6. Days and times vary. Visit youngpeoplestheatre.ca for details.